...a family member in his own right ... who helps make the Alzheimer’s journey less of a lonely one. It’s no secret that being a caregiver can at times be a lonesome journey. What helps me is I have a somebody who I share each and every day with. And that’s my dog Hugo. He comes with me when I go to see my husband who lives in an extended health care residence - a place that welcomes family pets in a big way. 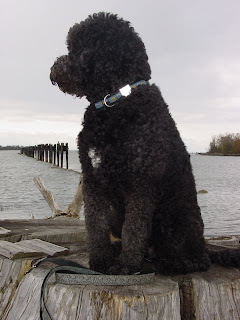 Hugo is a six year old Portuguese Water Dog. He knows the words, “We’re going to go see Ris.” He jumps in the car with one of his favourite toys. This breed of dog loves to carry things. I like to think it’s because of their work history when years ago they worked on Portuguese fish boats as paid crew members. Hugo these days indeed has a job to do. Carry your stuffy or your ball Hugo boy ... your visits cheer up a whole lot of people in there. You are a Minoru top dog! Hugo has the perfect temperament to be a friend for many of the residents. He is not a trained therapy dog. For the first two and half years of his life he had been a show dog, an American and Canadian champion. One of the reasons he showed well was he can wait forever and be patient. He likes to please. We got him when he was retired to be just a dog. 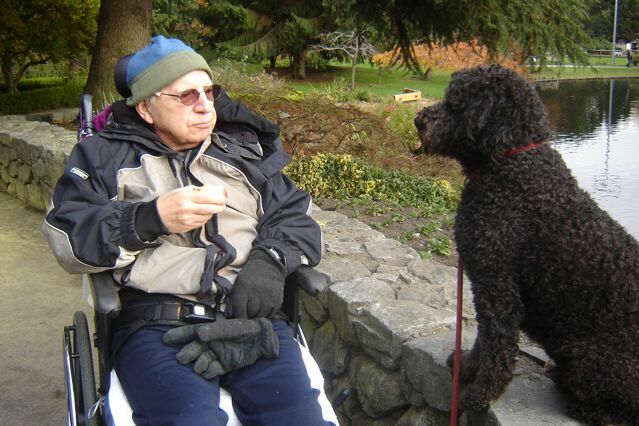 A dog for us and more importantly, a dog to engage my husband when we first found out he had Alzheimer’s in 2008. There is a routine to our visits. Get Hugo out of the car. Walk slowly up an incline to the front door entrance where we pass a garden I helped restore this year, and that now has Christmas lights on the large shrubs to warm a once neglected area. He waits while I punch in the easy-to-remember code and the doors make a familiar opening sound. In goes Hugo wagging his tail who by now has to be on a leash. He instantly begins to look for his friends. Many of the residents have pockets, purses full of dog biscuits. If he isn’t on a leash he can be goofy about running into a open cafe area where there is a large kitchen behind. It’s a busy kitchen that prepares meals for 250 residents. This is one place where obviously dogs are not allowed. Including you Hugo, despite your failed attempts to go into that awesome place of smells and trays of food. That’s his prompt to head upstairs to the second floor. You can tell immediately which residents have had dogs in their past lives. As we approach the nurses station I have to check out where the two cats are that have been living there for over a year. Hugo is naughty about thinking it’s okay to chase them. He is way better than before. The last thing I need is a Disney movie scene of a dog chasing two cats around and under the tables scaring the residents dozing in their chairs. Minutes later we head down another hallway to reach my husband’s room. Hugo continues to be a little bit confused despite we’ve being doing this routine for over two years. He’s puzzled why my husband doesn't greet him. Hugo is far too of a recent presence in his life. I wasn’t surprised when one day my husband asked me who the black thing was in his room. Hugo settles down on top of the bed. Last week he stood up and leaned over to sniff the top of my husband’s head who was sitting by a window playing with a set of blocks. My husband doesn’t know who Hugo is anymore but Hugo knows who he is, and that there is still somebody there. I like to think my dog doesn’t believe in the “long goodbye” approach to Alzheimer’s. He practises the “hello again” - which is way more positive. Our visits vary according to the weather, what’s happening if there is a special concert downstairs or if we’re there when it’s meal time. Hugo sits beside us trying not to be in the way as the care-aides, on their wheelie stools, are busy trying to feed so many. He waits for a spoonful of pureed turkey and spinach. When the visits are over. I look around for where he dropped his toy. We say our goodbyes. Then head back down the hallways. Hugo is often running by now, holding his leash (if he can’t find his toy) and knowing it’s “elevator” time. It means we’re leaving the residence that has become our second home. As I put Hugo back in the car I realize how lucky I am to have a constant companion who remains so cheerful - a family member in his own right ... who helps make the Alzheimer’s journey less of a lonely one.